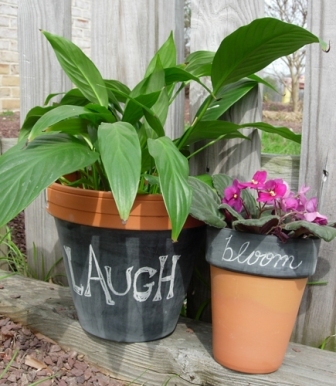 Spruce up garden pots in minutes with a coat of chalkboard paint, compliments of Tiffany Windsor of Inspired at Home. These make quick and easy Mother's Day gifts or hostess gifts. Say "Happy Birthday" or "Thanks" with a bit of chalk. Use tape to block off any areas that you do not want painted. When using the spray, I use paper towels and tape to block off any larger areas that I do not want oversprayed. Following label directions, spray pot with chalkboard paint. Let each coat dry completely. Let set 24 hours. Rub entire surface of paint with chalk and wipe off. Then you’re ready to write any message. Change it up whenever you like! Tiffany’s Designer Tips: I make these up by the dozen so that they are ready for any occasion. Since you can change the message, you can personalize them for any gift giving. Want to have some real colorful fun? Brush-on chalk paint is available in a variety of colors like red, pink and blue! What fun you and the kids will have making these pots! Check out more great garden pot ideas! What a super great idea these chalk paint pots are for gifts for that gardener or anyone who loves plants and putting the chalkboard paint on them is a good idea because it takes the guess work out of what plant or flower it is. Whynot make some for mom for her day and put herbs or vegetables in them. I may try this for myself because I am bad about forgetting what is where. When you want to transplant then wipe clean and put new plant on there or just put a saying or when you last feed the plant. Super idea. Have you ever seen the toy solider made out of clay pots? I saw it many years ago on a television craft show and would like to make them to "guard" our front door at Christmas time. It can be made in any size ... just depends on the pot size used. what a fun way to decorate and keep your flower pots organized. Kids would have fun with this as well.